A decision by Cedar Rapids city leaders to use taxpayer dollars to keep a Hy-Vee neighborhood grocery store drew significant ire, but a new sociology study proves the funds were well spent. There are several similarities between Topeka, Kansas — the focus of the study — and Cedar Rapids. Census figures for 2013 show the cities with a population of roughly 128,000, with a population density of about 2,000 people per square mile. Both cities are predominantly white, although Topeka is more quickly moving toward diversity. Median income levels are similar, as is the percentage of residents living at or below the poverty line. Given the similar demographics and geographic proximity, it shouldn’t be surprising the communities are also wrestling with similar cultural issues. Both are, for instance, searching for context behind recent shootings and hoping to address ongoing instances of violence — despite overall rates of violent crime decreasing. The communities are largely segregated, with people of similar backgrounds and ethnicities clumped in residential areas. But a key difference is that this month Topeka residents bid farewell to one of their last remaining inner-city, neighborhood grocery stores. Dillon’s Food Market, owned by Kroger, shuttered its doors on Feb. 13, despite rallying cries from the community and government officials. The news was of special interest to Michael Miller, a doctoral student in sociology at Kansas State University, since he only recently completed a study on food availability in Topeka. He chose the city for its proximity, and because there has been very little research on the intersection of neighborhood racial and income composition and healthy food availability in smaller urban areas. He used Census data to map neighborhoods by racial composition and income. Each tract held about 3,000 people, with inner city tracts being physically smaller due to population density. He then overlaid a map of grocery stores. “The very people who need the stores close because they have low income and not much transportation find themselves further away,” Miller said. Much of Topeka’s inner city was a food desert, an area with poor access to healthy and affordable food. Dillon’s closing made the situation worse. 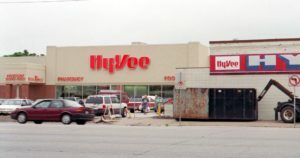 This Gazette file photo shows new Hy-Vee construction (left) on 1st Avenue in Cedar Rapids as well as the remnants of the old store (right) before it was demolished. It’s the same scenario Cedar Rapids faced in 2001, when officials offered nearly $1 million in upfront incentives to Hy-Vee Food Stores for a new store on its existing First Avenue site between the Wellington Heights and Moundview neighborhoods. Before the Hy-Vee agreement, city hall had not been in the business of extending tax incentives to retail establishments. It was a big debate then, and local opinion still runs strong. The subsequent decision by voters to oust those who supported and drove the deal, some say, is proof the public wasn’t behind the effort. City money, in the form of 20-year tax increment financing, was used to purchase the land, demolish the old store and pay for an enhanced exterior for the new building. Hy-Vee invested $5 million in the new store, according to Pearson, and anticipated doubling its number of employees. But perhaps lost over the years is why it is important for all neighborhoods, but especially those with lower incomes, to have access to food. “Segregation and limited access to fresh, nutritious and affordable food are twin pillars that work to entrench inequality, perpetuate poverty, and lessen the life chances of the disadvantaged,” Miller wrote in the study’s introduction. In other words, the more difficult it is for people to access healthy food, the more the community will pay. We’ll pay in higher rates of obesity and chronic health care conditions like hypertension, heart disease, stroke and diabetes that are prevalent in food deserts. The American Diabetes Association attributed more than $245 billion in health care costs to the disease in 2012. People in food deserts have shorter lives that are less productive than those who have access to and consume fresh foods. Children raised in those conditions have more challenges in school, which can bleed into adult life. Council’s decision to provide taxpayer funded incentives immediately benefitted adjacent neighborhoods, and elevated the entire community. In Topeka, city officials are now scrambling. Several city buses gathered in the former Dillon’s parking lot after the store closed. Residents need to learn new public transit routes to access fresh foods and fill prescriptions. The city offers tips on how to ride the bus while laden with groceries, as well as how to regulate the temperature of purchased food. History has shown many local residents will find this new reality too burdensome or time consuming. They’ll opt for the higher priced and processed foods more readily available at convenience stores or fast-food restaurants. It won’t take long before the garbage in, garbage out cycle costs far more than a 20-year tax incentive. This column by Lynda Waddington originally published in The Gazette on February 28, 2016.